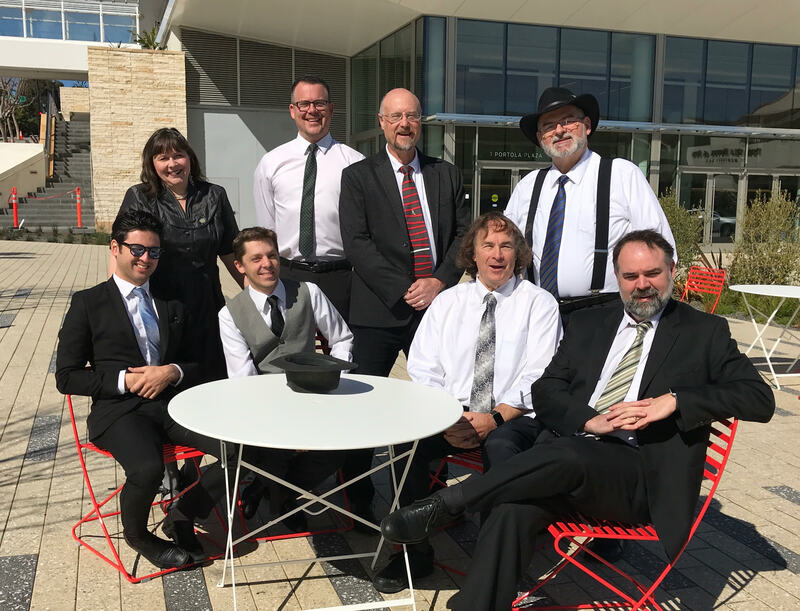 The Blue Street Jazz Band has been a major force on the Dixieland jazz circuit for over 30 years. Blue Street began in Fresno in 1983. Trumpet player and founder Forrest Helmick is now the only member still living in the Central Valley. Leader Dave Ruffner can be found playing his trombone almost every night on Bourbon Street in New Orleans. The front line is completed by one of the most in demand reed players on the circuit today, the fabulous Nate Ketner. The band showcases the wonderful singing of the “Siren of the San Joaquin” – Ms. Sherri Colby. The true unsung heroes of the band are Rick, Matt, Sam, and Jason, perhaps the finest, most versatile, humble, and good looking rhythm section in all of Traditional Jazz. Original songs and creative arrangements are the hallmark of the band. Although traditional jazz is the cornerstone on which the band was built, the band earned the reputation as “The Bad Boys of Dixieland” for their eclectic tastes in music. At any given Blue Street performance the audience is liable to hear various styles of music including swing, Mardi Gras, folk songs, marches, waltzes, Latin music, and hymns. The band has performed feature sets devoted to the music of Kid Ory, Jelly Roll Morton, Sidney Bechet, the History of Jazz, or Louis Armstrong. Audiences particularly enjoy Blue Street’s Sunday morning gospel programs. Blue Street has played every major jazz festival in the United States and has performed in Canada, Mexico, and Europe as well. The band has recorded twenty-four top selling albums.